I felt autumn and today it was cold. So I decided to shoe my beloved UGG boots. I have them for a long time, but they are still excellent. Better boots I haven´t. They are fluffy, comfortable, waterproof and also especially good in cold weather. From The current collection, I especially prefer these three. Which do you like best? Už je cítiť jeseň a dnes bola naozaj zima. Teda som sa rozhodla zobrať si na prechádzku moje milované UGG čižmy. Mám ich už dlhší čas, ale sú stále výborné. Lepšie čižmy som zatiaľ nemala. Sú mäkučké, pohodlné, teplučké a nepremokajú. Výborné do chladného počasia. Z aktuálnej kolekcie ma najviac oslovili tieto tri kúsky. Ktoré by ste si zvolili? The hot pink pair are cute. Like the black too. Thanks for posting the photos and feel free to drop by me too when you have time. They are great for winter! Love the simple brown ones and I don't know if you know the grey woolen uggs, but these are gorgeous! 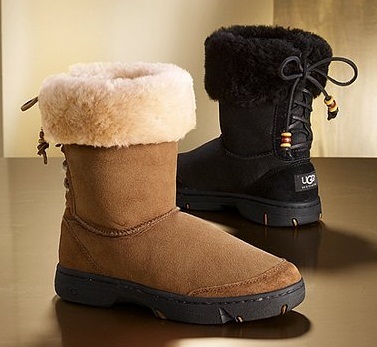 I like the Ugg Classic Short more! They are great for those cold, snowy days! The pink ones are my faves!! i love your blog; its very nice! Personally I'm not a huge fan of uggs, they're so clumsy. Hi dear, thanks for stopping by, your boots look so warm and comfy, wow I like those black sequin ones! Red and blue - very good combination!